SUP Storage. 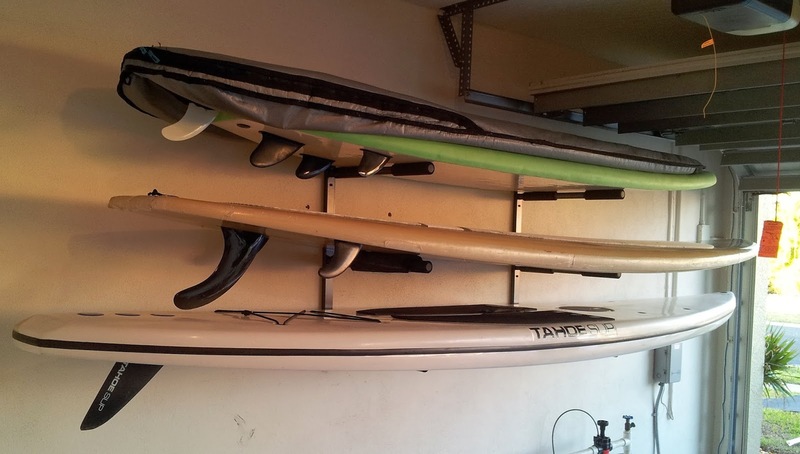 We've covered storage and display racks for paddleboards and surfboards a few times on our blog, including best SUP racks, SUP ceiling rack, and SUP triple storage rack. Well, we keep getting more photos and reviews from our customers of their SUP racks, so we've got to post 'em. Here is what it generally the standard setup for our triple storage rack: mounting it in the garage for storage and display of 3 boards. 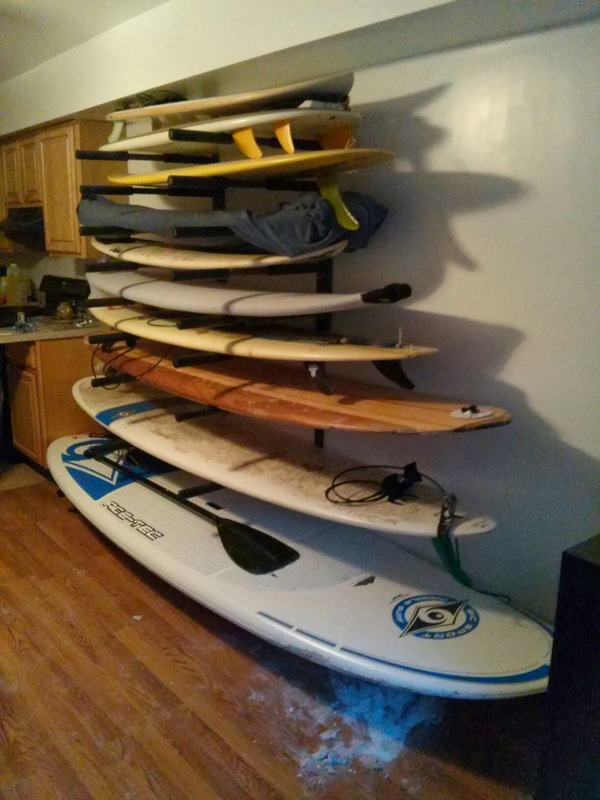 Here we've got one paddle board, one longboard surfboard, and two more shortboard surfboards stacked on the top rack level. This rack is a great way to keep your garage organized and to keep your boards safe and in top shape. I can imagine the picture of what this garage looked like before this rack...boards upright vertically, sitting on their tails, leaning against the wall, one on top of the other, getting wax everywhere, not to mention a lot of busted fiberglass. This is way better! The first 2 racks in the post both focused on quantity of board storage, using a triple storage rack for maximum utility in storage. As you can see from this picture, this customer is focused on the display! Granted, the picture was taken around Christmas, so the lights may be a seasonal thing, but this customer has their paddleboard mounted on their wall right above their TV! This is just a single rack mounted on the wall that is a great option to feature your paddleboard right in your house. This could be the family room, the basement or a bedroom - in any room, this rack looks great. Check it out. I call this dedication. I see 10 boards in this picture, between surfboards and paddle boards. And it looks like this rack is next to their kitchen! Typically we see our racks hung in garages, living rooms, outside, in sheds, but nothing wrong with the kitchen...So this customer stacked a few of the triple racks on top of each other to get storage for 10+ boards. Nice!